Due to the fact that cyberpunk stories usually take place in grungy cityscapes with bright neon accents sprinkled all over the place, you can pull off some fun lighting setups that might not normally make sense. This is the perfect time to bust out the colored gels and go a little overboard. I find the colored light looks especially awesome for edge lighting; also it’s a safe bet to have opposite colors on different sides. Thanks to Photoshop you can always change the hues later - so just by having a drastic splash of color here and there, it will be easy to alter the tones in post if need be. It’s super easy to Photoshop in the extra neon lights by setting them to the “screen” blending mode - this makes it so the dark pixels of that layer are transparent. You just have to decide where each one fits best into the puzzle of your image, as you’ll want to find the right balance of colors and placement so your compositions flows nicely. 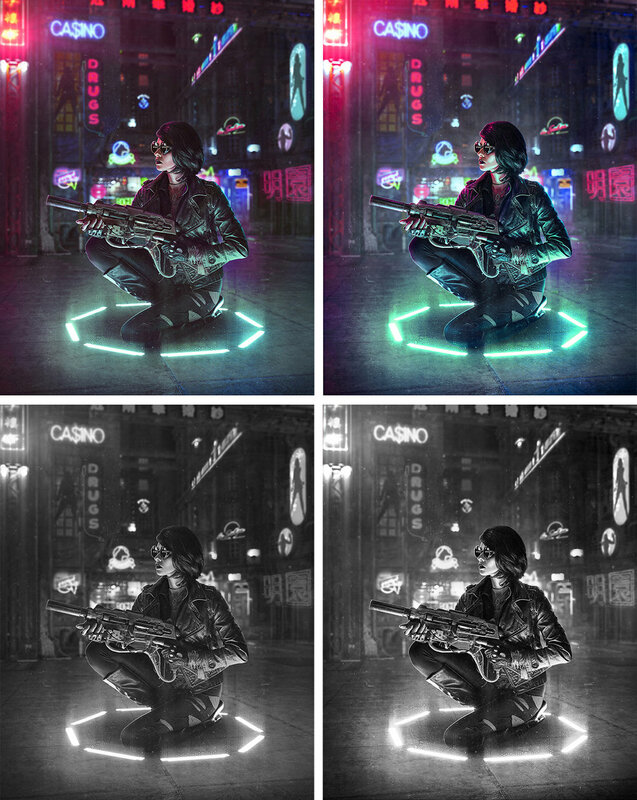 A few things to watch out for: most often you’ll need to mask away the edges of the neon light images. Even though the dark pixels around the neon will be transparent when in the “screen” blending mode, you’ll usually end up with a faint box around the light since the background is almost never totally black. Also, be sure you are matching perspective - If you want to put a light on the side of a building, you’ll have to transform and skew it to match the angles of that side of the building so it looks like it’s actually on the surface. Lastly, if you blur the background like I did, be sure to give the neon signs the same blur effect so it looks believable. Once I switched over to black and white it became more apparent that my subject did indeed require some extra separation from the background. On a new layer behind my subject, I used a cloud/smoke brush from this set and painted with white at about 10% opacity to build up some atmosphere. I figured the city could be a bit smoggy, plus the farther away something in an image is, the lighter it will appear - because science. I also painted with white on an “overlay” layer to bring up some of the highlights on the areas and details I wanted to stand out more. Then I tweaked the overall contrast to make it slightly punchier. Chromatic aberration is technically digital distortion, and that just feels so perfectly fitting for a cyberpunk image. I love the effect it gives and the fact that it can help to further blend all of the various components I’ve composited together. Since it’s an effect that a camera can produce on an actual photograph, by adding it to my finished composite it can tell the viewer that all these pieces were “actually” in front of the camera and not faked together in Photoshop ... well I want it to say that, anyway. You can go about the second part of this effect a bunch of different ways. Essentially all you need to do is move that layer in some fashion so it no longer lines up with the image below and it will give you the off-kilter-colors-effect we are going for. This can be achieved by simply moving the layer one way a little, perhaps stretch it larger, or maybe even rotate it a tiny bit. You can do a warp transform and pull the corners out a bit, heck even mess around with the distortion filters - so long as you move the pixels somehow, you’ll see the effect in action.